'Hedge Rows', originally built for Walter G. Oakman c. 1892 and pictured here under the ownership of Alvin William Krech in Southampton. Krech was the chairman of the board of the Equitable Trust Company and died at his desk in 1928 at the age of 70. He was considered one of the most prominent members of Wall Street and also held the positions of president of the Equitable Safe Deposit Co., vice-president of the Mercantile Trust Co. and was a director on the boards of 18 other companies. He was a partner in the construction firm of Shepard Siems & Co. and vice-president of the Wheeling & Lake Erie Railroad. Krech arrived in New York in 1894 as the Secretary of the Reorganization Committee for the Union Pacific Railway. He was president of the Equitable Trust Company from 1903 to 1923 at which time he became chairman of the board. 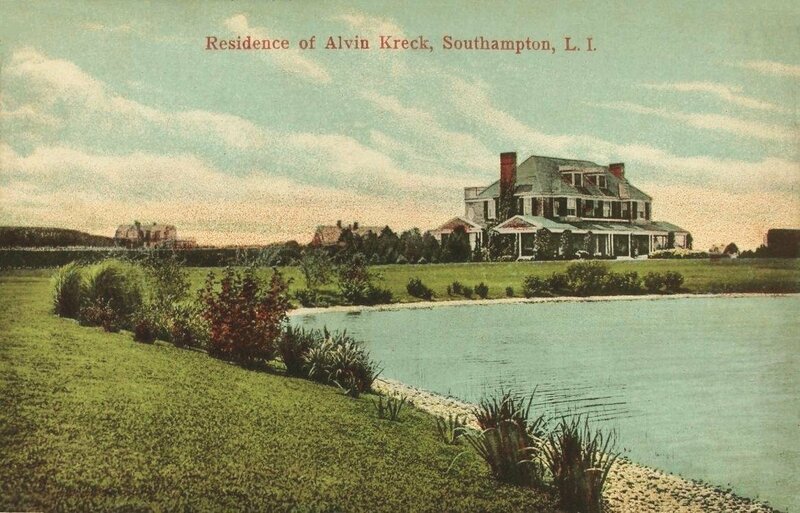 According to Southampton Village Review the Krechs owned 'Hedge Rows' for fifty years but it was subsequently demolished.